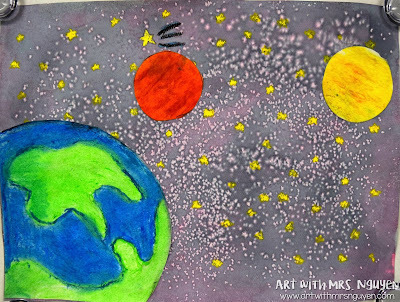 So I've been doing an oil pastel planet project with my 5th graders for the past two years.. but have never been absolutely in love with it. Yeahhhh they were cool looking - but I wanted more! 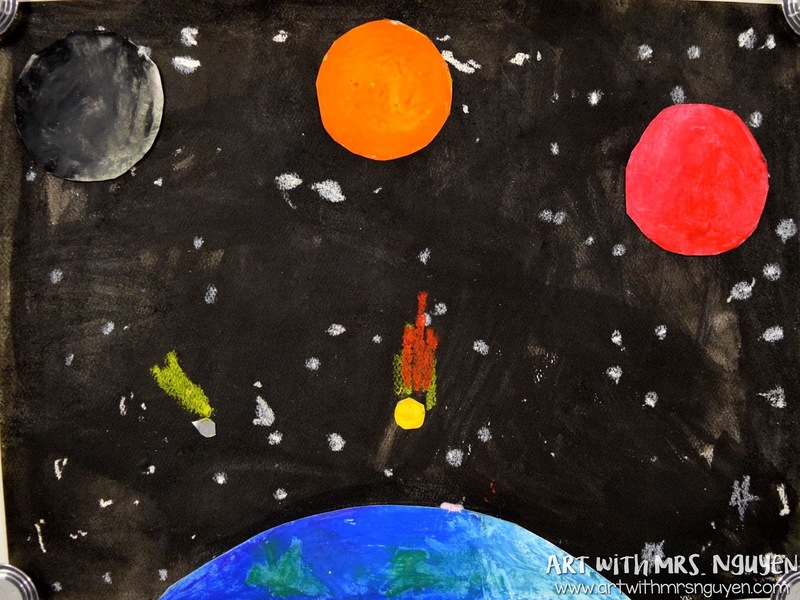 So here is my Oil Pastel Planet project 2.0! 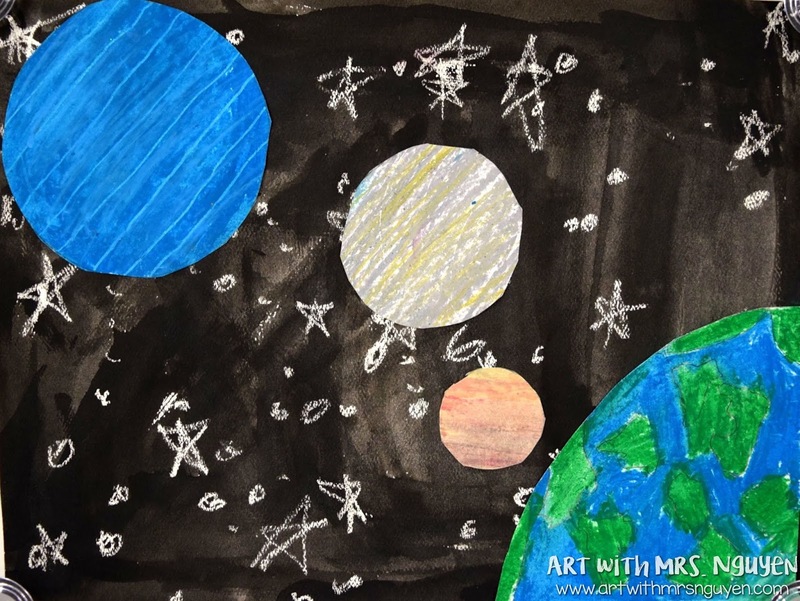 After learning about the planets, our conversation transitioned to how the planets in the images had the illusion of looking like spheres instead of just flat circles. We then compared a picture of a flat black circle to a picture of a sphere and talked about the similarities and differences. This eventually leads to a student pointing out that the image of the sphere has a shadow while the circle does not. From that point we talk about what causes shadows (and from there highlights) and the different types of shadows (form shadows vs cast shadows). We also talk about how highlights and shadows can be created using tints and shades. After that whole bit, I tell my students that they will be creating their own (made-up) outer space images using oil pastels and watercolors. But before they can begin, they have to create 4 sketches of interesting looking space compositions (we talk about space, arrangement, overlapping, and visual interest). The next day they come in, their first job is to finish up their sketches, then select their favorite one to use for a basis for their final artwork. Once that is decided, they begin making the planets on a sheet of heavy white drawing paper using a circle compass tool (that's a whole lesson in itself) and oil pastels. I have them create their planets of a separate piece of paper so if they make a mistake it doesn't ruin the rest of the artwork. 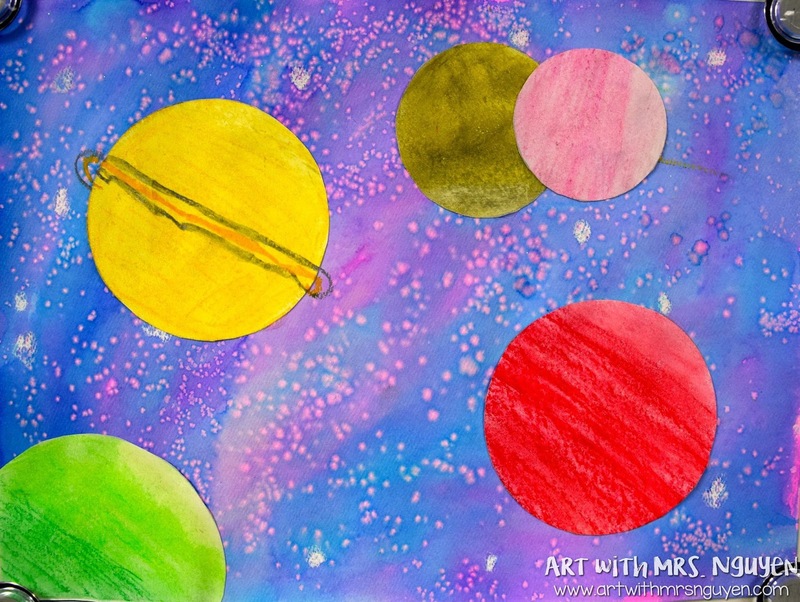 The planets will be later cut out and glued onto their background paper. On the third day, my students began by creating their background on watercolor paper. 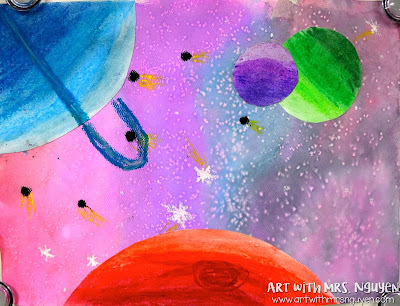 I really wanted my kids to be able to use the salt-on-watercolor technique to create some really starry looking skies.. but had a hard time making it work using regular pan watercolors (liquid watercolors work 10000x better). The only problem with using liquid watercolors though, is that my black doesn't actually look like black -- like at all. So I gave my students the choice.. they could do a wax resist using pan watercolors (black) OR they could use a variety of liquid watercolors so they could use the salt technique. Most of them opted to use the liquid watercolors, but I still had a few students who really preferred to use the pan watercolors to create a solid black sky. 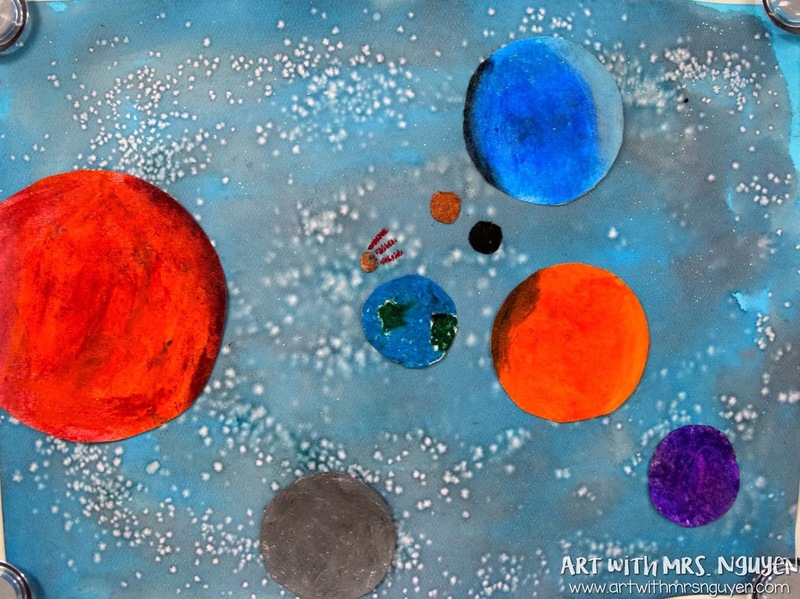 Once their backgrounds were dry and their oil pastel drawings finished, they cut out their planets and glued them on top of their backgrounds. *Rings for planets were added once everything was glued down. I think I may finally be on the right track to turning this into one of my favorite projects. 1. 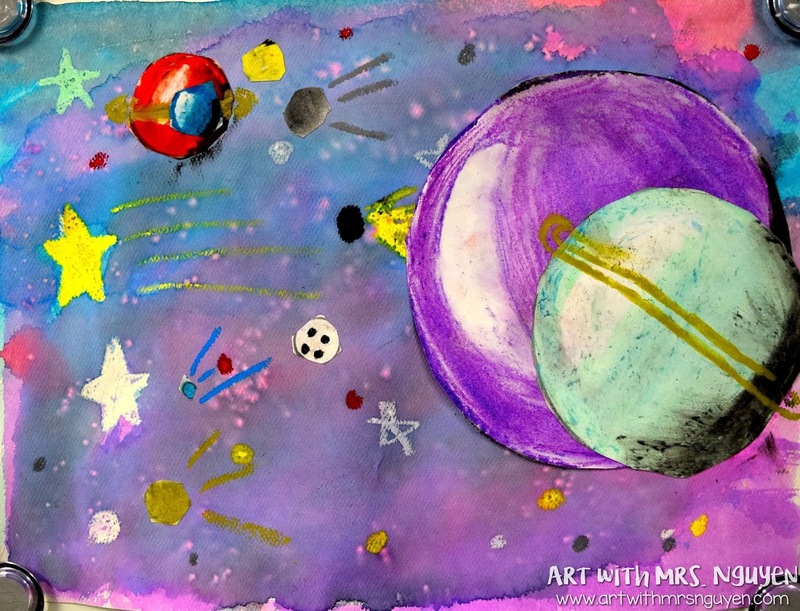 Students did not have to do all the planets in our solar system and they could create their own. 2. I focused a LOT more on composition and arrangement. 3. We used a cool watercolor technique for the background vs. just painting on black paper. Thanks! 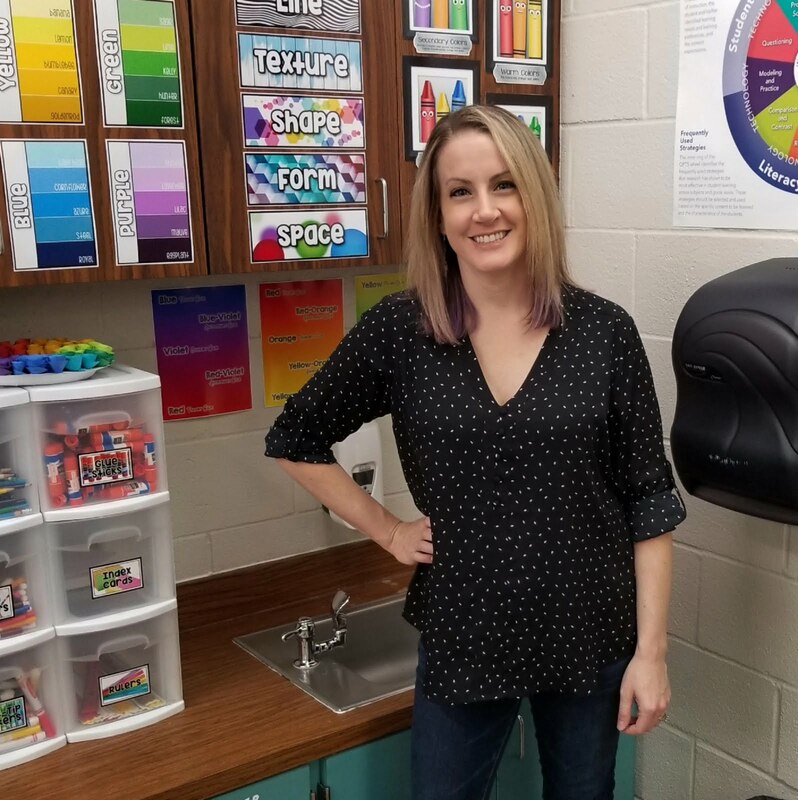 I can't wait to try this out with another class and see what they can do! These are gorgeous. When i did my outer space lesson earlier this year a student asked me, "Is pluto not a planet because it blew up?" And I know that I *should* have told the truth and used it as a true teaching moment but i decided to troll instead and I answered. . . "Yup"
How did you organize/disperse the liquid watercolor? I put them into 2oz souflee cups and have those sitting in a palette (the kind used for tempera cakes). What a fun project. Thanks for including my blog in your sidebar! Thank you for sharing your wonderful idea! I'm going to adapt this and use it for my S3 class. We're creating Hubble Telescope Inspired images. I love the idea of using watercolour and salt.